The player first chooses a opponent from one of 5 opponents, 4 male and 1 female. This allows everyone to play against their own skill/strength level. Each of the male opponents, places their own amount of pressure via the arm. If a player is unable to beat an opponent or beats one too easier. They can change opponents. 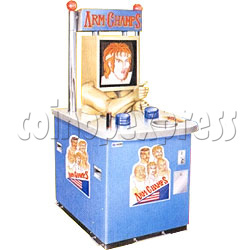 The player rests their elbow in the elbow rest area and grips the robotic arm. Play is based on tournament rules.